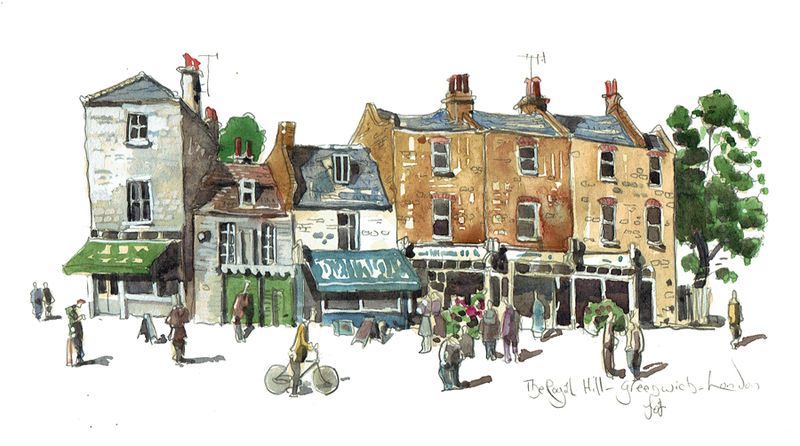 Sign up to my newsletter and you can enter the free draw to win this original preparatory painting worth £160 of The Royal Hill in Greenwich, London. This watercolour study is 21cm x 13cm, signed and mounted on acid-free card. The newsletter will be sent out on the 23rd March 2017. I look forward to your sign up in the box on this page. Britain is a wasteland of franchise hell, so it is always a real treat, to see a little string of local shops tucked into a residential area serving a local community. The Cheese Board has been here for over 20 years and they are experts in all things cheese. They sell over 100 varieties of cheese from all over Europe and if you require bottle of red to send it all down with, then they can help you here too. They even do a delivery service. What’s not to like! A few doors down you will find Drings the butchers. Meat is their speciality, and their sausages are made on the premises, they even run classes in butchery should you wish to take them. I make my own sausages myself and it is very satisfying watching your own recipe sizzling away on a BBQ. The Creaky Shed is a local greengrocer specialising in seasonal food, much of it unusual and interesting varieties. The interior has a touch of a rustic allotment shop about it. And the displays at the shop front worthy of Chelsea. Of course, these are not the cheapest places you can go to, although if you look abroad, especially in the Mediterranean countries where food quality has a far higher currency there are far more places like this. So stepping off of the retail park, and getting at least a portion of the weekly shop from places like these is a real treat and it supports the local community too. Hi Liam , well done on all your latest commissions. Was watching the BBC Big painting Challenge, kept saying Liam could do that, but loved the eventual winner anyway. Husband thinks I`m nuts. Yes Please to your latest free draw .